Caring for a horse has never been a piece of cake. There are loads of things to pay attention to, among which are the horse’s hoof boots. The best horse hoof boots offer necessary traction and grip force on slippery surfaces, protect and provide comfort to the horse’s barefoot. But how to choose the best ones among a wide variety of products on the market nowadays? Don’t worry because we’ve come to your rescue! Follow us closely to gain an insight into the best horse hoof boots guide so as to make the right decision. How to Choose the Best Horse Hoof Boots? Q1: How many types of hoof protection? Q2: What is the role of hoof protection? Q3: What is the best hoof boot type for jumping? Q4: What is the best hoof boot brand on the market? The product is a perfect match for a beginner rider with less than 25 miles per week. This type of boot is also most favored by its application and removal. A fancy painted front cover helps to avoid scratches and fading colors, as well as prolong the trail boot’s lifespan. Besides, a modern invention of Snug Strap has succeeded in getting rid of manual attachment. Snug Strap is designed with a simple screw-on feature, making the hoof boots easier to change direction from left to right, remove and replace. Concerning that the boots may slip off the horseshoes while running? The double Velcro loop attachment will take care of that matter because it’s made especially for protecting the hoof wall and securing the boot. Thanks to high-quality loop Velcro and grade hook, dirty mud and debris have no longer become a problem, making the ride more enjoyable and comfortable. 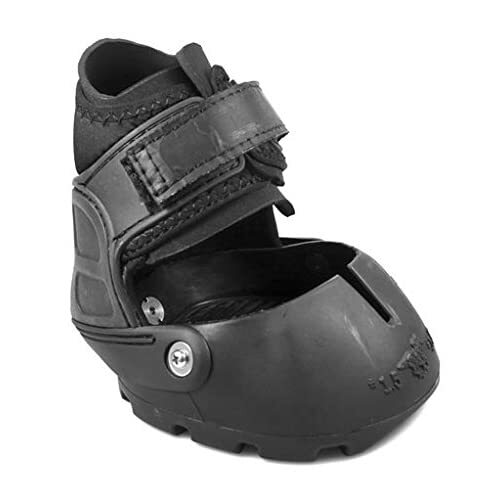 If you are into a casual riding of up to 25 miles per week, Easyboot Trail is a great companion in supporting and protecting the sensitive parts of the hoofs. Besides, durable and versatile material brings comfort to your horse for many hours of riding on challenging surfaces. Easyboot Glove leads horse riders into a world of well-maintained and well-supported hoof boots. Your horse will feel an absolute comfort when these boots embrace their hoofs in a fitful way like real skin. Moreover, the two idea features – flexibility and toughness – provide effective traction to the hoofs while allowing free movements. There is also no need to worry about the annoying feelings of grass and tree sticks getting inside the hoofs because they don’t come with external hardware. Also, because the hoofs are covered with high-quality material, debris hardly finds any way in even under sandy and muddy weather conditions. Not to mention the elastic cups attached at the back of the gaiter is of great help in dividing the balance and strength of the horse as well as its strides equally. In short, Easyboot Glove is a perfect product for riding on rugged, muddy and hilly terraces. The heels are the most rubbed areas but it’s no longer a big problem now when there are many methods to prevent the seizure. Look out for heavy mud finding its way into the gaiter’s Velcro. In this case, use duct tape around the gaiter to stop that annoyance. This multifunctional hoof boot is an effective “sidekick” of your horse’s hooves on rough surfaces. 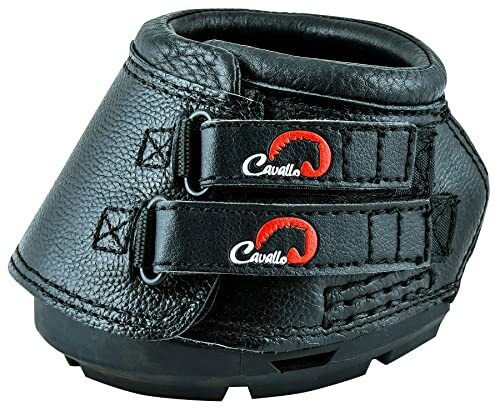 When using Cavallo Simple boots, your horse will be specially treated with many benefits, from offering comfort for hoof sensitivity, quickening rehabilitation of injuries to soothing sole bruising. In terms of material, Cavallo Simple has created a whole new level by using high-quality leather as the main material for its boots. Besides, an ample cushioning inside another layer of leather is a perfect addition to the boot’s impressive durability. Thus, the boot’s lifespan can last for years because of guaranteed materials. Regarding the boot’s usage, you can rest assured that it can be worn on a great number of terrain types at ease. However, there are no special features or designs on this boot. But this can be a good thing because it widens the variety of terrains that the boot can work on. One of the most amazing things about this boot is that it has a layer of rubber packed in the thick outsole, increasing the abilities of the boot to deal with every type of terrain. When it comes to prices, a Cavallo Simple boot is a little bit pricier than the other two types of boots mentioned earlier. But with its material and performance, it’s worth opening your wallet. It’s almost impossible that a low price can go with a top-notch product made from high-quality leather. You will soon see the price is more or less important when compared to the boot’s materials and effective performance. Let’s think about this simple comparison: all-terrain boots vs one terrain boots. Which one appears more attractive? All terrain boots refer to those which can provide smooth performance on every terrain, thus helping to save a good deal amount of money in the long term. What a cost-effective product! Let me introduce you to a totally different type of boot – Kavallerie PRO-K Support Boot. You can easily spot the difference from its design. Unlike the three hoof boots above which cover the hooves, this type of boots stands out with two opening holes on both sides. These openings work as risk-reducing features of placing steps wrongly. Let’s discover how they do that! Firstly, the introduction of triple-lock Velcro has saved many horses from unwanted injuries. This type of lock not only offers a secure hold on the horse’s hoof but also is easy to adjust to different hooves’ sizes. Besides, the hoof needs to meet the required length so as to cover the whole foot as well as stays firm enough to avoid risky movements. 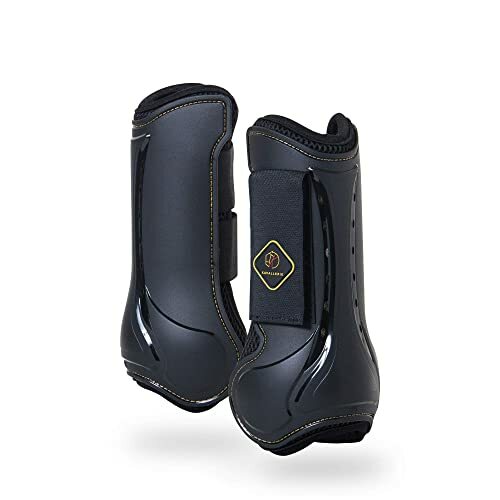 Secondly, a shock-resistant feature of this boot also attracts a great number of buyers because of its absolute comfort and effective protection of the hoof. This revolutionary feature includes a comfortable pad at the forefront, enabling the horse to move at a wider range. Thirdly, the boot comes with an attractive price, not too expensive but not too cheap either. Grab one of these impressive best hoof boots before the price going up, horse owners! The price is about to increase because of the boot’s outstanding and unique features. The boot catches your attention immediately by its eye-catching blue royal color and its special name – Hoof Saver. Let’s discover how this boot saves your horse’s hoof. 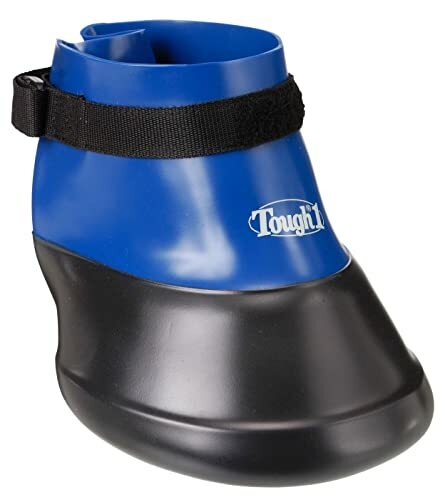 Firstly, the Tough 1 brand has succeeded in creating a hoof boot with therapeutic qualities. The boot is designed to keep all types of hoof medication, making the caring process of owners much simpler. The best thing about this feature is that your horse doesn’t have to end up lying at one place miserably but feel free to move around while their hooves are in a healing process. Secondly, a triple-layer design is also another big plus of this Hoof Saver Boot. The added layers make the hoot thicker and more stable than other similar products of this type. Speaking of the horse’s vulnerable hoof, it’s understandable to have an extra layer, meaning extra protection, to protect the hoof from any potential damage. Thirdly, the price of Hoof Boot Saver is insignificant, which means it’s one of the cheapest hoof boots out there on the market. You can both enjoy the boot’s great service and save a lot of money. With the top 5 best horse hoof boots mentioned above, the task of finding a suitable pair for your horse has become easier than ever. But before jumping into any type of rushed decisions, let’s look at some important criteria when shopping for a hoof boot. I’m sure that you don’t want to spend hours after hours figuring how to take the boot off or put it on. Thus, make sure to keep an eye out for the boots equipped with a simple closure system, among which is Velcro. This type of closure is highly beneficial because it not only helps to save plenty of time of removing and installing but also has the ability to easily adjust to fit your horse’s hoof without affecting its performance. It’s unavoidable that with all the rugged and rough ridings, your horse’s hoof boot is likely to go through a common process of wear and tear. Therefore, choose the boot that is as much durable as possible. Quality of material: Remember to go for high-quality materials because they are more beneficial and economical in the long run. Size is considered the most crucial factors when you are shopping for the hoof boot. Perfect size is the one that provides a complete fitting for the horse’s hoof, ensures comfort and protection, as well as enables the horse to move freely. Numerous! Similar to traditional shoes, hoof protection comes with a wide variety of types, depending on different terrains and functionality. Apart from its main role of protecting the horse’s hooves, hoof protection also include some outstanding healing properties to prevent lameness. All of the top 5 products listed above all work well for jumping. As long as their design is lightweight and their material is of high quality, these boots will make you feel satisfied with its performance. Hmm, it’s hard to come up with the most satisfactory answer. Most of the brands I have mentioned in this article can become a good example and verification when doing shopping for a hoof boot. The answer to this question, I believe, depends on the type of activities you and your horse like to involve in. Hoping that our list of the best horse hoof boots will be of great help to you when making your decision. An ideal product must be the one designed to provide protection and comfort to the horse’ hooves. Not to mention that it also has to be cost-effective and long-lasting. If you ask us, we highly recommend the Cavallo Simple Hoof Boot. 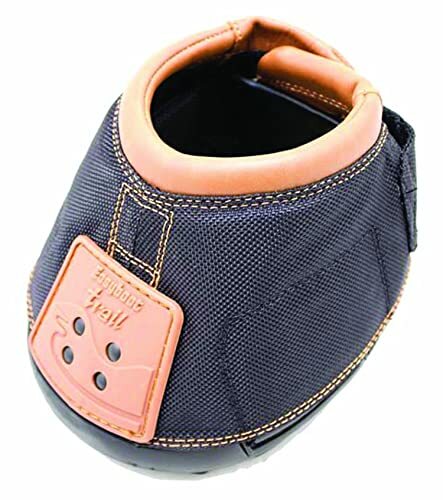 Being one of the best hoof boots on the market nowadays, its all-terrain feature and leather made material contributes to making the product a new best friend to your horse. Don’t hesitate to contact us if any queries arise because we’re available 24/7! Thanks for reading and hope you succeed on your journey to find the best hoof boot.